Surrounded by the distinctive red rock formations of the Southwest, you can perfect your game on the 18-hole golf course at The Sedona Golf Resort located directly adjacent to our resort. Leisure activities abound at this retreat where swimming pools, outdoor Jacuzzi and a fitness center await your arrival. 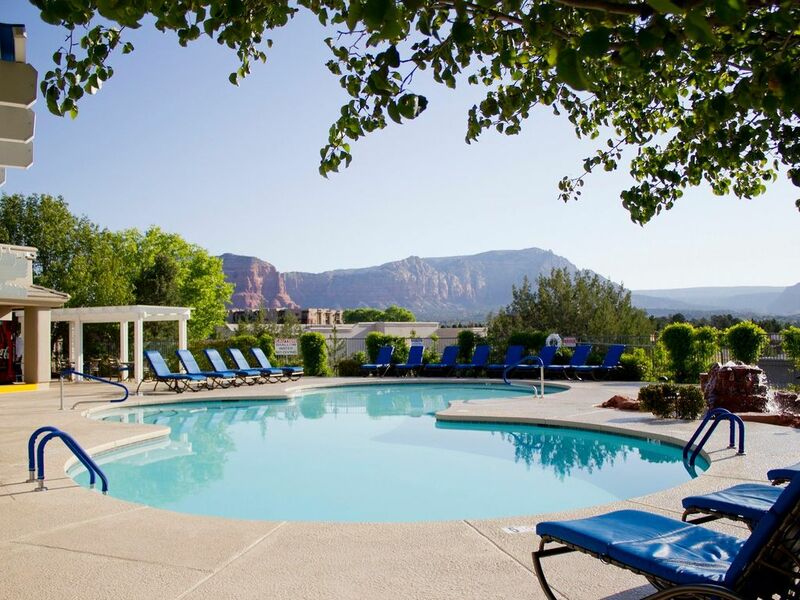 Whether you’re hiking or exploring the splendor of Oak Creek Canyon and the desert vistas via a Jeep® tour, you'll look forward to returning to the comforts awaiting you at The Ridge on Sedona Golf Resort. · 4/12/2019 through 4/26/2019 the resort will be resealing the lobby parking lot. During this time, guests will experience some noise, smell tar and see construction workers/equipment during the daytime hours. There will be alternate parking available for guests to utilize for check in. · 7/5/2019 through 7/19/2019 the resort will be painting building exteriors. During this time, guests will experience some noise and see construction workers/equipment during the daytime hours. · 7/26/2019 through 10/4/2019 the resort will be undergoing soft renovations for 4 buildings. Additionally during this time the resort will be completing the conversion to natural gas. During this time, guests will experience some noise and see construction workers/equipment during the daytime hours. · 11/29/2019-12/13/2019- the resort will be painting building exteriors. During this time, guests will experience some noise and see construction workers/equipment during the daytime hours. Relax comfortably in accommodations featuring a queen size bed and sofa bed. Our Studio accommodation offers a full bathroom featuring a walk-in shower, complimentary amenities and hair dryer. Enjoy the convenience of your kitchenette equipped with a stove top, refrigerator, microwave and coffee maker among other modern appliances. Additional in-room amenities include cable/satellite television, DVD player, iron/ironing board, telephone and air conditioning. Please contact the resort for any special needs or requests where our friendly staff will assist you. No RV or motor home parking allowed at this resort. Advertised as sandstone views, there were NO views...only of the parking lot! Disappointed there were no sandstone views as advertised,(view of the parking lot), unit is very small, light bulbs are extremely bright, and hot tub was not functioning. The cleaning crews come early in the mornings and make too much noise in neighboring units. 6am a guy was cleaning the BBQs...banging things around. Check in is with Diamond Resorts, and an additional fee is collected, and hard sell for the resorts. We like the location, and love the golf course, but will stay somewhere else next time. We take our guest feedback as a way to improve our service, it is through the feedback of valued guests such as yourself that we will continue to improve. Great resort on a beautiful golf course! Beautiful views of red rocks from the golf course. Resort had a beautiful pool and hot tubs. The studio condo had everything we needed. Resort fees are extra however. Thank you for the 5 star review - we are so happy to hear you enjoyed your stay here with us! We appreciate you taking the time to share your recent experience and that you enjoyed our location and what the property has to offer. NOTE: The Resort Fee is not included in the daily average nightly taxes & fee and is collected at check-in. This is stated within the listing details as well as your reservation confirmation email. Please know the $14.95 resort fee includes WiFi, 24 hour fitness center, pools, dvd rentals, seasonal activities, garden gas grills, 24 hour lobby coffee, tea and cocoa, business center computer/internet and boarding pass printing. Not impressed with time share push by the reps. The condo was really nice. It was within walking distance to dining venues. Thank you for your feedback. We work hard to make our guests happy and appreciate you taking the time to share your thoughts about your recent stay. We take our guest reviews as a way to improve our service and as such we have shared your comments with our on-site team. We look forward to welcoming you back the next time you are in town! Wife and I spent 3 nights at this property in February. Were happy with the accommodations but surprised we were charged a daily resort fee above what we paid for the condo. Was under the impression this was included in my original payment. That said, I would gladly stay here again. Thank you for taking the time to share your recent experience at our property and that you enjoyed your accommodations and your stay here with us. We do our best to show all property information and details within the listing and we are saddened that you did not know about the mandatory daily resort fee due at check-in which is stated within the listing details as well as the reservation confirmation email for guests to know prior to arrival. Please know that the *Resort Fee includes recreational facilities including: pools and hot tubs, garden activities, 24 hour fitness center, garden gas grills, seasonal activities, 24 hour lobby coffee/tea, 24 hour business center computer/internet. Michael M.Where do you live? Thank you so much for taking the time to share you experience with us and that you enjoyed your stay.. We work hard to make our guests happy and appreciate your feedback! We hope to see you again real soon! Beautiful, clean, well keeped property, our studio was very comfortable. The only thing keeping me from giving it a 5 was the studios overlook the parking lots. Still love the place. Hotel Guests: A photo identification, credit card for $100 security deposit and a nightly rate of $14.95 plus tax resort fee* will be required (cash is not an acceptable form of deposit). *Resort Fee includes WiFi, 24 hour fitness center, pools, dvd rentals, seasonal activities, garden gas grills, 24 hour lobby coffee, tea and cocoa, business center computer/internet and boarding pass printing. This property charges a mandatory resort fee due at check-in. Please check listings for details. Rates subject to change. Click "Book it Now" for rates and availability. Reservations may be cancelled up to 8 days prior to arrival. A cancellation fee of 25% of the reservation will be charged. Cancellation requests made 7 days or less prior to arrival are non-refundable.